Since becoming a clinical instructor in the College of Nursing and Health in 2011, Stephanie Triplett has become one of Wright State’s most distinguished nurse educators. 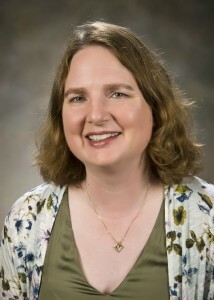 Throughout her career at Wright State, Triplett has worked collaboratively as the co-coordinator of a senior-level clinical course, taught undergraduate pathophysiology, and provided expert clinical supervision at the undergraduate level. She also worked in partnership with another faculty member to evaluate and update components of a course focusing on the nursing management of individuals with complex, critical illnesses. She consistently demonstrates the ability to apply current evidence and practical application in her teaching style. On top of all that, Triplett is adept at engaging a class in a large lecture hall or students in a team-based learning environment, always guiding them through the process of making the connections between theory and application. Triplett’s previous experience as a manager in a complex health care setting has given her the unique ability to use important techniques in “crucial conversations” with students regarding their performance. She is skilled in communicating with compassion, while not compromising the high standards of the profession and in the College of Nursing and Health. In addition to her many teaching responsibilities, Triplett continues to practice at the bedside as a certified critical care nurse, giving her the ability to provide students with a current perspective on the realities of being a registered nurse. She is also well positioned to assist the career development of graduates due to her networking connections within the local hospital community.